edited by W. Scott Grant and Dan Hembree, has 60 pages of quality content brought to you for absolutely free. This issue includes a solo adventure “Down Time”, a GM adventure “The Wild Woods”, a short story “Turmierre Returns to the Sky”, a new NPC from the world of Lingusia, rules for horses and riding and mass combat in T&T, as well as the continuing series “Delverton” and “How to Write a Solo Adventure.” Contributors include Tori Bergquist, Michael Eidson, Patrice Geille, W. Scott Grant, Christina Lea, Al McDougall, Simon Rafe, Lee Reynoldson, Zachary and Joshua Ullery, Russ Westbrook, and Justin Williams. 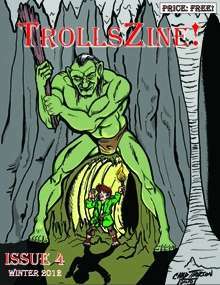 TrollsZine 4 is illustrated by Alexander Cook, Jeff Freels, Mike Hill, Andy Kelly, Will Meddis, Steve Robertson, David Ullery, and Zachary Ullery with cover art by Chad Thorsen. TrollsZine is a Trollbridge production brought to you with the kind support of Flying Buffalo Inc., Ken St. Andre, and Rick Loomis.